Developmentalist Cities addresses the missing urban story in research on East Asian developmentalism and the missing developmentalist story in studies of East Asian urbanization. It does so by promoting inter-disciplinary research into the subject of urban developmentalism: a term that editors Jamie Doucette and Bae-Gyoon Park use to highlight the particular nature of the urban as a site of and for developmentalist intervention. The contributors to this volume deepen this concept by examining the legacy of how Cold War and post-Cold War geopolitical economy, spaces of exception (from special zones to industrial districts), and diverse forms of expertise have helped produce urban space in East Asia. Contributors: Carolyn Cartier, Christina Kim Chilcote, Young Jin Choi, Jamie Doucette, Eli Friedman, Jim Glassman, Heidi Gottfried, Laam Hae, Jinn-yuh Hsu, Iam Chong Ip, Jin-Bum Jang, Soo-Hyun Kim, Jana M. Kleibert, Kah Wee Lee, Seung-Ook Lee, Christina Moon, Bae-Gyoon Park, Hyun Bang Shin. Developmentalist Cities? 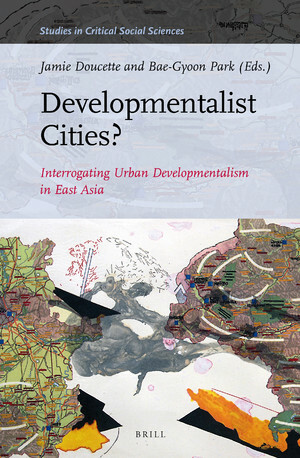 Interrogating Urban Developmentalism in East Asia, eds. Jamie Doucette and Bae-Gyoon Park (Brill Publishers, November 26, 2018), https://doi.org/10.1163/9789004383609.